CAN AM Winter Series: The second year of the 2.4mR CAN-AM winter series is currently underway with the four regattas completed at Charlotte Harbour Yacht Club in Florida. These events are drawing between 15 and 20 boats and so far the conditions have been outstanding. No days have been lost because of either insufficient winds or too much wind and the air temperatures have been warm. The final event takes place March 29 – 31. Already plans are afoot for the 2018 – 2019 Winter Series. We investigating a dedicated website for the series which will be loaded with information to make it easier for sailors to attend. 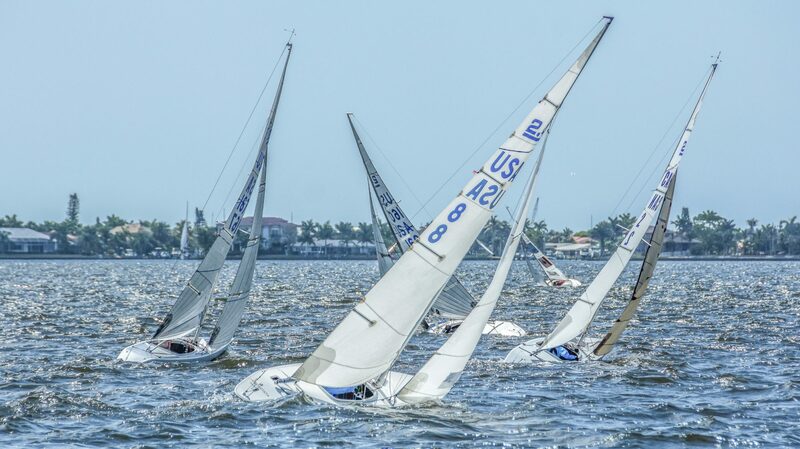 It is our goal to reach out to European sailors to attend our Can Am series as air travel between Europe and southwestern Florida is relatively easy. 2018 Regatta Schedule: As regatta dates, host clubs, and venues are known they are being posted on the class website. We are working to confirm the dates of the Toronto area regattas. Pointe Claire Yacht Club in Montreal will be hosting our 2018 Canadian Championships August 10, 11, & 12th. Events in the United States which may be of interest to our members are being posted as we become aware of them. Please check the website regularly for all the latest news. 2018 Class Membership and Dues: Our class membership year runs April 1 to March 31. The webmaster updated the website and opened the membership registration and renewal for the 2018-2019 membership year. This requires both renewing and new members to complete the Membership Form and pay the membership dues through Paypal. Although we do take payment by cheque as well, our preferred payment option is Paypal. Please don’t hand either the class secretary or myself cash at a regatta to pay your membership dues. Although we are honest we are also forgetful so your dues may not be credited to you. 2018 dues are $ 50.00 (same as 2017). Class Website: We had problems in September 2017 with the host of our class website. Thanks to the tireless work of Aaron Wong-Sing, the website was rebuilt and we continue to receive positive comments from our members, from 2.4mR sailors from other countries, and from sailors in other classes within Canada. Making the job easier for Aaron has been Doug Bell, Dee Smith and Bruce Millar all who have contributed articles to the website. The website is our voice to the sailing community at large so if you have anything you wish to share please pass it to the webmaster. Buoyancy Tests and Certificates: Regular buoyancy tests are a safety issue. At the 2017 Canada Games two boats failed their initial buoyancy tests and required addition floatation materials before they were permitted to race. It was a good thing because two boats did swamp in the one heavy air race and required assistance in being pumped out. If you do not have a buoyancy certificate for your boat or if your certificate was issued in 2013 or earlier you must be tested before you will be permitted to race in class events in 2018. Contact the class measurer (Bruce Millar) to arrange for a buoyancy test. Clagett Regatta Foundation: The Clagett Regatta Foundation which organizes the Annual Thomas Clagett Jr Regatta in Newport RI issued a call in November 2017 for requests to use one of two new 2.4mR sailboats for a one to four year duration. They are happy to announce that Delani Hulme-Lawrence of Royal Victoria Yacht Club (Canada Games 2.4mR sailor 2013 & 2017) and Shaylagh Ley of Nepean Sailing Club (Martin 16 Mobility Cup sailor 2016 & 2017) are the recipients of the boats. Both are young sailors who are really enthusiastic to join our class. We welcome them to the starting line. Please remember to send your questions, reports, pictures and gripes to the class e-mail address [at][dot].